Set Alert for Product: Смартфон LG G7 ThinQ 64 Гб черный G710EMV - 59,990 руб. This product is available in Just, Holodilnik, Amazon.co.uk, Svyaznoy, Mediamarkt, 123. At just.ru you can purchase Смартфон LG G7 ThinQ черный 6.1" 64 Гб NFC LTE Wi-Fi GPS 3G G710EMV for only 110 руб., which is 100% less than the cost in 123 (59,990 руб.). The lowest price of Смартфон LG G7 ThinQ 64 Гб черный G710EMV was obtained on March 28, 2019 1:49 pm. The LG G7 ThinQ is a completely unsurprising, risk-averse smartphone that’s meant to be smart, not flashy. It has an AI-powered camera, loud ‘Boombox’ speaker, and a bright 6.1-inch display. It’s a reasonable, but not a monumental upgrade over the LG G6. 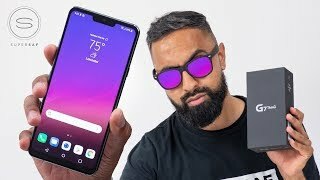 LG G7 ThinQ mobile features a 6.1″ (15.49 cm) display with a screen resolution of 1440 x 3120 pixels and runs on Android v8.0 (Oreo) operating system. The device is powered by Octa core, 2.8 GHz processor paired with 4 GB of RAM. As far as the battery is concerned it has 3000 mAh. Over that, as far as the rear camera is concerned this mobile has a 16 MP camera. Super Far-Field Voice Recognition means your Google Assistant is always there to help and will respond with real-time support from anywhere in the room.